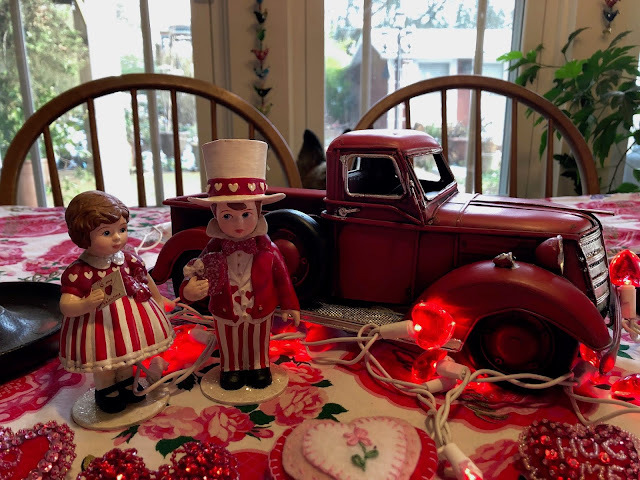 As you may have surmised, I love to decorate for each holiday. 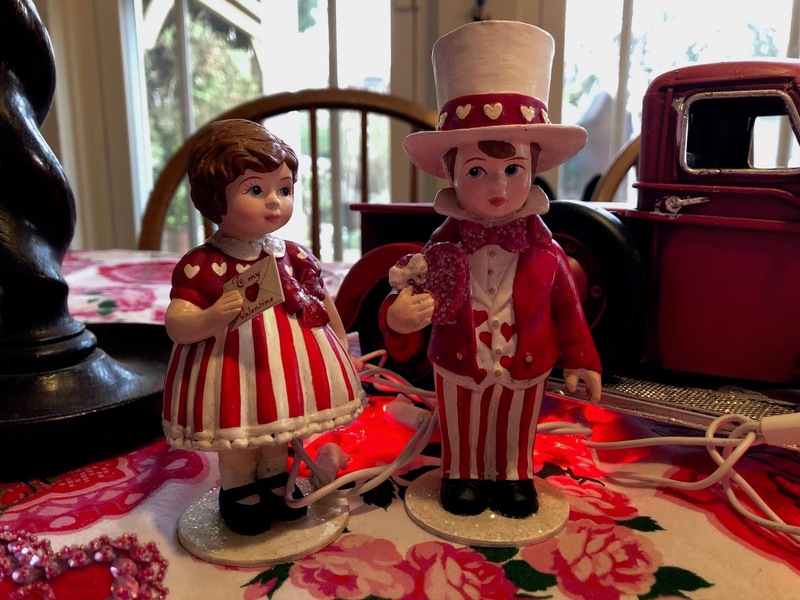 I have a special Valentine tablecloth.. but not a lot of decorative items.. to Amazon I go to find this pair of darling figurines. These are designed by Bethany Lowe, she makes the cutest, vintage inspired things. They arrived yesterday.. I think they're darling! 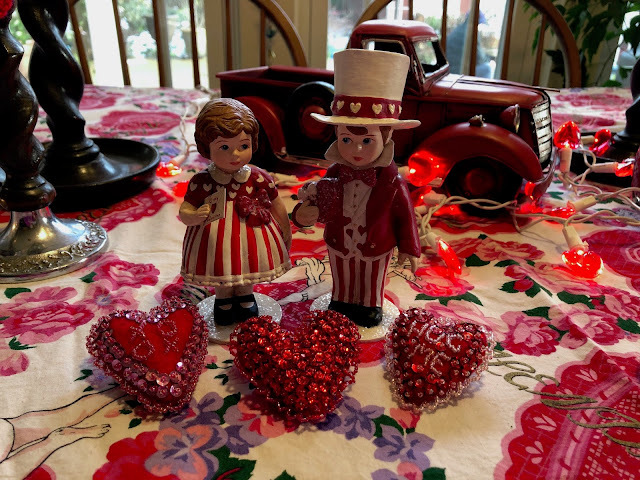 I have a little old style truck that is red so I put that on the table, surrounded it with heart lights, put the little couple by the truck, and added some of my heart pins that I have made using felt and sequins. I am so enjoying seeing this tableaux from my easy chair and each time I walk by. Here are my 3 sequin pins I've made and on the top is a heart pin made by my blog friend Betsy! 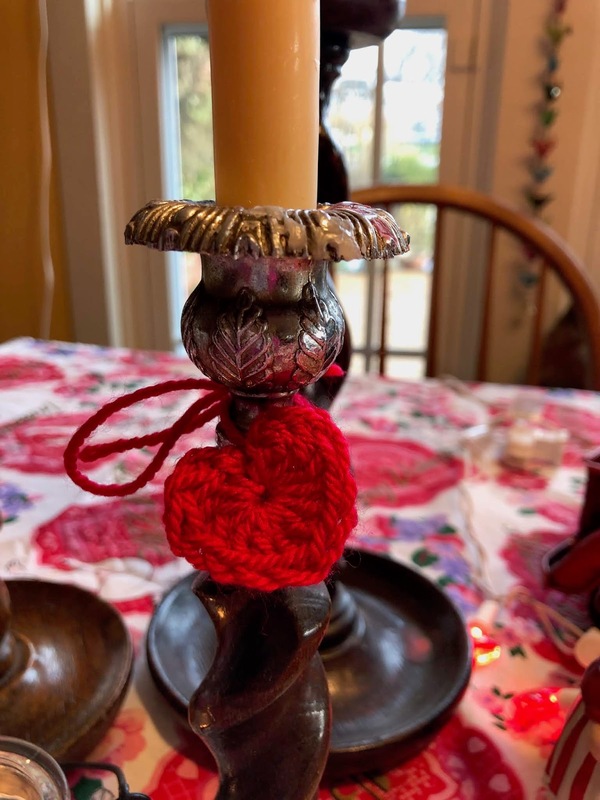 And my blog friend Gracie sent two of these darling crocheted hearts with her Christmas card - I tied them on a pair of my barley twist candlesticks. Sweet! My "kids" and heart pins. 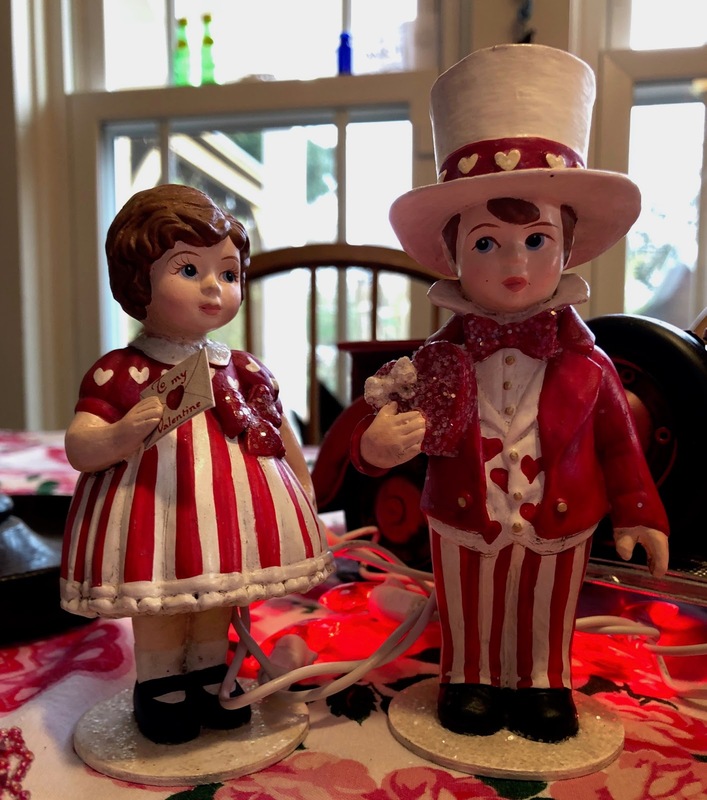 I attended the Portland Women's Forum meeting yesterday and we have a little White Elephant Sale each meeting to raise money for our treasury - I always find something neat.. 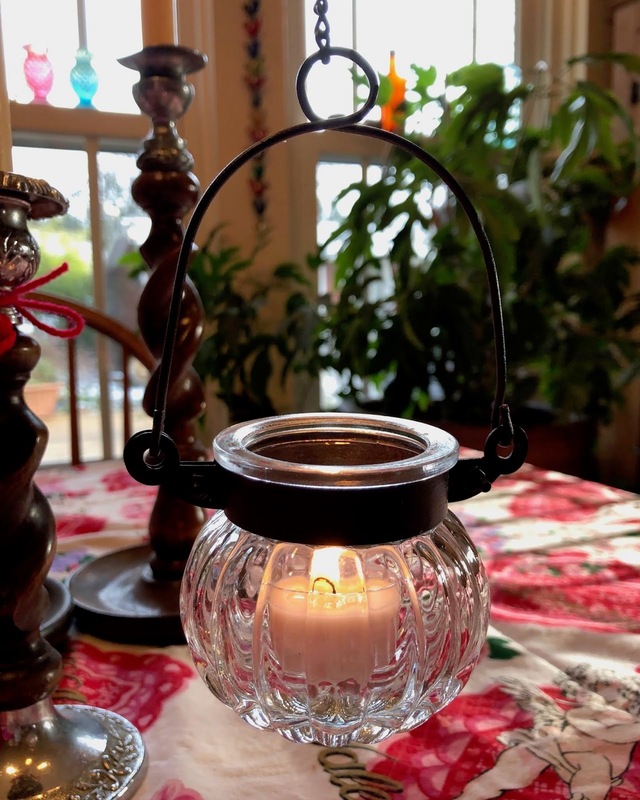 I got two of these little hanging lanterns for $1 each - I think they will come in handy if we have a power outage, hanging from the chandelier. 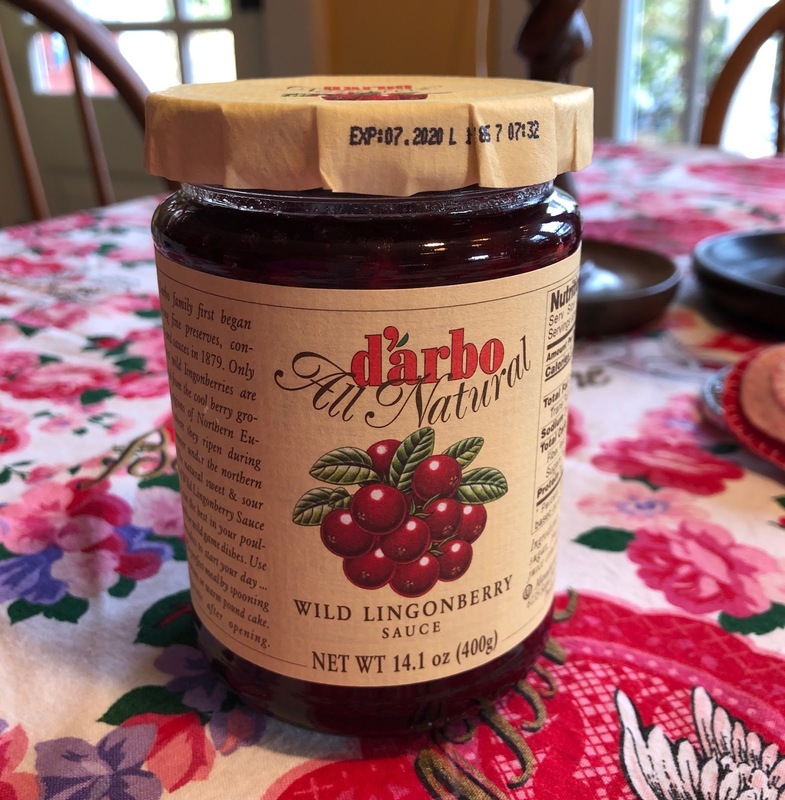 I also bought this jam for $2, can't wait to try it. 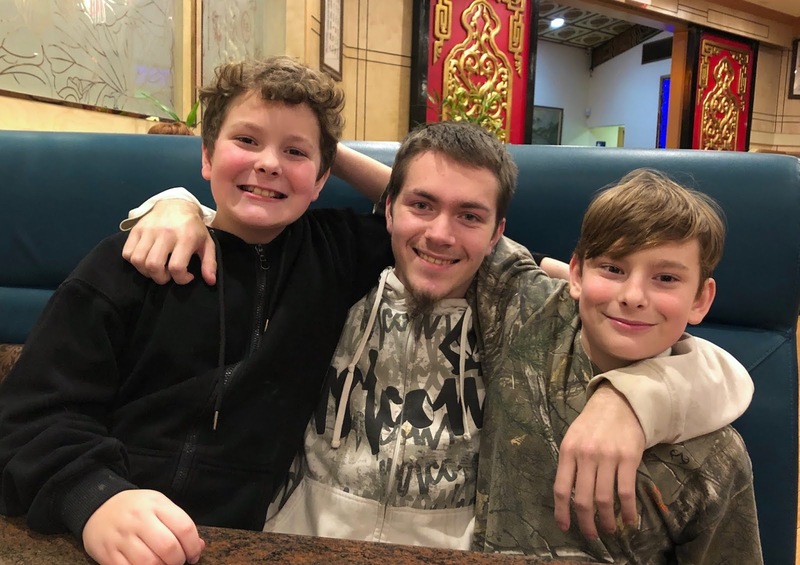 Our two youngest grandsons decided they wanted to spend one night a week with us, which we're happy about, we took them out to Chinese and sushi dinner last night. They sure love their cousin, who lives with us since before Thanksgiving. This was my fortune.. I think they are good words to live by. She made a real advance on her house training today, too. So, we're happy about that. I love your table vignette. The figurines are adorable. So fun to have the grands for sleepovers... we are having one with two of ours on Sunday night. So glad Mocha is settling in and getting the hang of housebreaking. Happy weekend! What a fun post. You have more Valentines decorations than I do. I just have a few little hearts that I’ve put around here and there. I’m glad Mocha is settling in so well. She looks like a little doll. I would love to have a lapdog although I do have a lap cat. 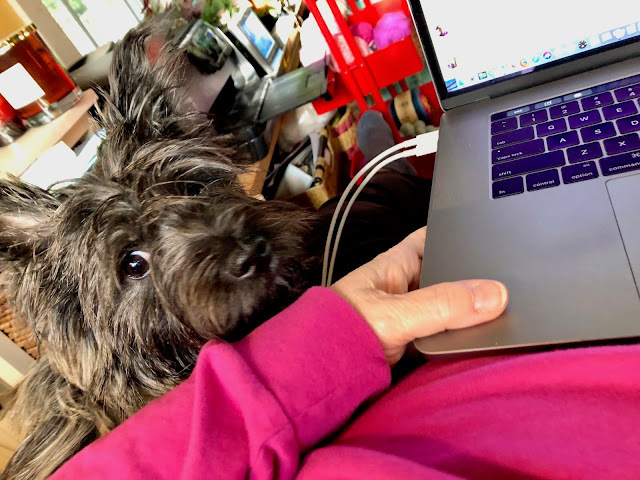 Frannie is curled up on my lap right now. That is a great picture of your grand boys. They look like they all get along very well. You are blessed. Snow! We were supposed to get a light dusting this morning. So far it’s about 6 inches and still coming down heavily. It’s predicted to snow tonight, tomorrow night, Sunday and several times next week. So much for a mild winter. I had to drive up to South Hill this morning for physical therapy but I’ve made it back home safely, thank goodness. Stay inside and stay warm. 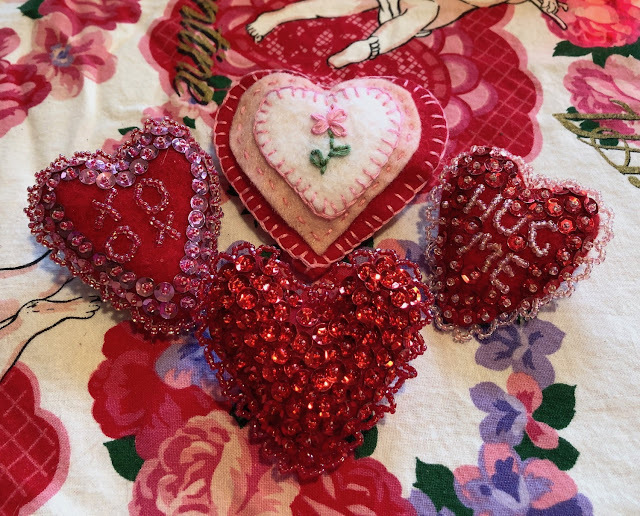 What darling decorations and the pins you made are lovely! That Betsy sure gets around! She's amazing how much she makes and gives to others. Good deals at the White Elephant sale. I love your house and you live on a farm and you're getting a snowstorm? I am wishing I were there! Love your little dog too...so sweet. Hi Teresa. How lovely that the boys are going to spend a night a week with you. I really should take a leaf out of your book and have some Valentine decorations! Fireman was wondering if you were getting snow!!! I love all your decorations. !!! Those candles in the glass were a real score!!!! Stay safe! I have one wooden heart to hang outside . I better get it out there soon. I have 6 Valentines and I better get them in the mail! Oh and I m in love with Mocha ! Those hearts are beautiful! You and Betsy did lovely work. You will have a quite festive Valentine's Day. *Maybe* some snow predicted here for Tuesday. What a lovely little Valentine scene. The figurines are so cute. Thrilled to read little Mocha is settling in well and is getting the hang of house training. 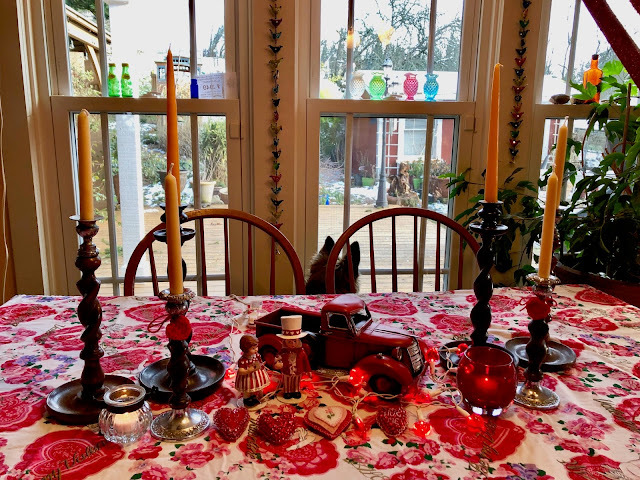 Love all your hearts, the table looks wonderful. Lovely to see the boys having fun together. 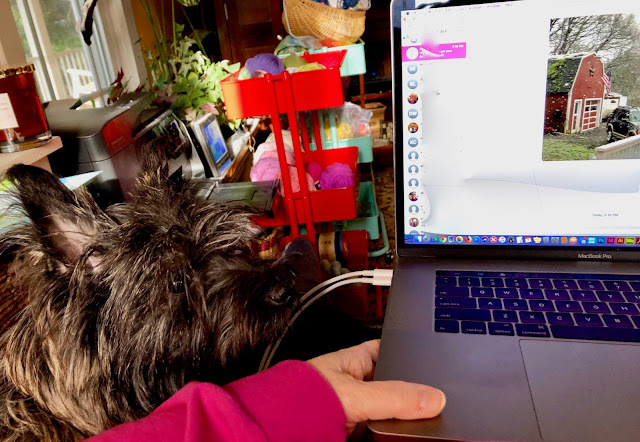 just love spending time visiting your blog, I always feel like we are sitting together visiting! Very very cloudy and dull here. We've had some rain the past couple of days. Those figurines are so adorable and go perfectly with the truck and the other items you've put together on the table. I also like the hanging lanterns. Hope you are having a good weekend. Kisses to Mocha. The boys look so happy together. Mocha is a lucky little one to live with such a wonderful family. No holiday decorations here but Little B is done with his Valentines for school, yay! Like you, I love decorating for every holiday. Hi Teresa - what sweet Valentine decorations. I haven't done much seasonal decorating other than at Christmas since my daughter was little, but you're inspiring me! I may just do a little springtime/Easter decorating. Mocha is adorable - how nice to have a sweet little sidekick.